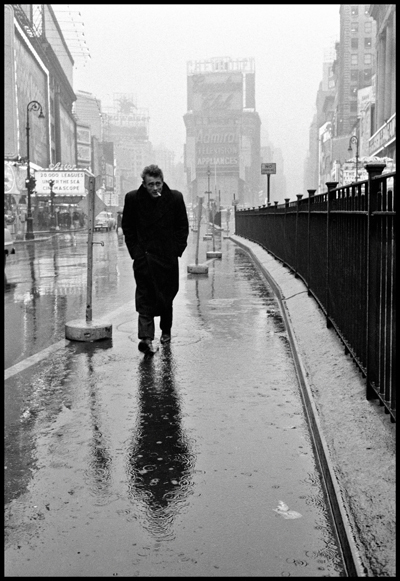 Dennis Stocku2019s atmospheric photograph of Hollywood actor James Dean is one of the great movie-star portraits. We look at why this image is seen as an Icon of Photography. When Dennis Stock attended a screening of James Dean?s first film, East of Eden, he knew he wanted to photograph him. He sensed that this charismatic young actor would soon join Marlon Brando and Paul Newman as one of the major film stars of his generation. Stock, who had met Dean at a Hollywood party in January 1955, asked him to be the subject of a photo essay. Dean, who was not yet famous, readily accepted the invitation. Stock then approached Life magazine with the idea and within a week the assignment was agreed. It took two months to complete. The first part of the assignment involved taking Dean back to his home town of Fairmount, Indiana. ?For Jimmy, it was going home,? Stock later wrote, ?but it was also the realisation that the meteoric rise to fame had already begun to cut him off forever from his small-town Midwestern origins, and that he could never really go home again. Still, in those bitter-cold late winter days, as Jimmy and I roamed the town and farm and fields of Fairmount, visiting family and friends, I came to know, or at least to glimpse, the real James Dean.? Stock?s photographs showed Dean in various locations: at home with family members, in a classroom at his old school and in a pigsty at his uncle?s farm. In one bizarre sequence, Dean was shown posing in an open coffin at a local funeral parlour. The pictures were intended to be darkly amusing but now seem strangely prophetic; seven months later, Dean was dead. The rest of the assignment included images of Dean in New York, then in rehearsal and on film sets in California. Away from his home environment, Dean became unpredictable. ?The moment we hit New York he started seeing old friends and ending up in bars for hours on end,? Stock later said. ?He became an insomniac and very hard to work with, often not turning up at appointments. But I knew where to find him. I was simply tenacious.? While in New York, Dean attended classes at the famous Actor?s Studio, directed by Lee Strasberg. While on the way to the studio one day, Stock photographed Dean in nearby Times Square. Rain was falling heavily and a light mist hung in the distance. Stock asked Dean to walk towards him a couple of times and shot just four frames with the actor at different distances from the camera. Three of the four frames showed Dean at the centre of the image, his outline conflicting with a building behind him. However, one of the shots was perfectly composed, with Dean placed against a clearer background and roughly one third of the way across the frame. Stock had instinctively used Dean?s reflection in the wet street as part of his composition, and further strengthened the image by using the pavement and railings on the right to lead into the subject. As well as having the ideal composition, the weather conditions lent the image a moody atmosphere that expressed something about Dean?s character. He looks solitary and battered by the elements, but at the same time looks coolly resilient to his surroundings. The picture also has a biographical element in that the background includes the awnings of cinemas where, as a young actor, he aspired to appear. For Stock, the photograph?s success is due to several factors. As he told me in an interview in 2004, ?The picture has legs because it shows two symbols, not one: James Dean, a glamorous movie star who died young, and Times Square, New York. As a Hollywood portrait it?s extremely peculiar because of the size of Dean. It?s rare that you have a movie star who is that small in the picture. The implication is that I didn?t photograph him as a movie star; here the surroundings are as important as the star.? Another small detail added to the photograph?s impact. ?In those days, we all had dangling cigarettes,? Stock continued. ?We all looked like we were a little bit in pain, a bit menacing. In the picture, your eye goes to the cigarette in his mouth; if the cigarette wasn?t there, it wouldn?t have worked.? Dean?s fame was almost entirely posthumous; his two other films, Rebel Without a Cause and Giant, were released after he was killed in a road accident later that year. Although intended as part of a wider biographical story, Stock?s Times Square photograph has, in retrospect, become the single iconic picture that characterises James Dean and encapsulates his image as a tragic and doomed film star. Dennis Stock died on 11 January 2010, aged 81. The full story of Dennis Stock?s photo essay on James Dean is told in James Dean: Fifty Years Ago (published by Abrams, 2005). More of Dennis Stock?s work is published in Made in the USA: Photographs 1951-1971. It is currently out of print, but available (albeit expensively) from www.amazon.co.uk. More than 80 images from Stock?s James Dean portfolio can be seen in his section on the Magnum website at www.magnumphotos.com. An audio recording of Stock talking about the photographs is also on the site in the ?Magnum in Motion? section. The site includes a broad selection of work from Stock?s many other assignments.